I have been wanting to get my hands on this book for awhile, but my library doesn’t have a copy yet! But luckily for me, my birthday was recently, which means lots of Chapters gift cards =D. So, this was the first book I bought with my presents. Everneath is the story of Nikki, Jack, and Cole. Nikki was hurting, and ultimately gave herself up to Cole, an Everliving who feeds off the energy of mortal humans. Nikki and Cole spent a century together in the Everneath, (sort of like the Underworld, though not exactly) although only six months went by on the surface. In that time, Nikki forgot everything…except for Jack. And when the Feed is over, she chooses to Return to her normal life for one last six month visit, so that she can try and make-up for the damage she caused when she left. I liked the concept of this book. 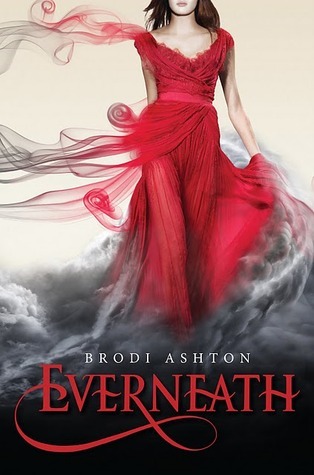 The mythological aspects of it were neat, and the idea of the Everneath was kind of cool. I also really liked some of the one-on-one conversations and interactions between characters, which were really well-done and made me totally believe the chemistry and past the characters had with one another. However, I have to admit that, overall, this book left me feeling a bit disappointed. To me, this book would have been much better as the second book in the series, not the first. The flashbacks explaining the events leading up to Nikki choosing to go with Cole were way more interesting than what was happening in the present, and I think having a full book leading up to her descent into the Everneath would have been a great way to really flesh out relationships and explain more about the rules of the Everneath. Those rules were something I really felt needed more attention; for instance, Nikki mentions that she lost all of her memories during her time in the Everneath, but about two minutes after the Feed ends, she seems to remember everything again. Those type of details were sort of thrown in here and there as reminders, but they weren’t really important to the story, and they weren’t explained well enough for my liking. I also would have loved to see a bit more conflict with Cole. I like Cole. He’s got layers, you know? Like an onion. Or a cake. And he’s only partially to blame for Nikki’s descent–he did warn her about how dangerous it was, after all. But once Nikki Returns, Cole seems to be the 100% bad guy, while Jack is an angel. And the evidence just didn’t support that treatment of him. Nikki spent a century with Cole. They were literally tangled together, combined as one being. So…I would think their relationship would be pretty bloody deep, even if it wasn’t the same kind of relationship as Nikki had with Jack. I would have liked a bit more struggle, maybe with Jack wanting Cole out of the picture, and Nikki defending him for reasons Jack couldn’t understand. It was a little too simplified for my taste, I guess. Now, I will say that this is the first in a trilogy, and perhaps some of my concerns will be addressed later in the series. But for me, I was kind of let down by this book. I think Ashton’s writing is good, and it was an easy read to get through, but there were some issues in the details of the plot that I couldn’t get past. However, for those liking paranormal romance, and modern plots tied in with mythology, this could be a great read!